We are a catalyst for smarter government serving smarter citizens. Background: In 2016, the Florida legislature passed a requirement for the public to have access to the database of recreational activities and locations throughout the state. 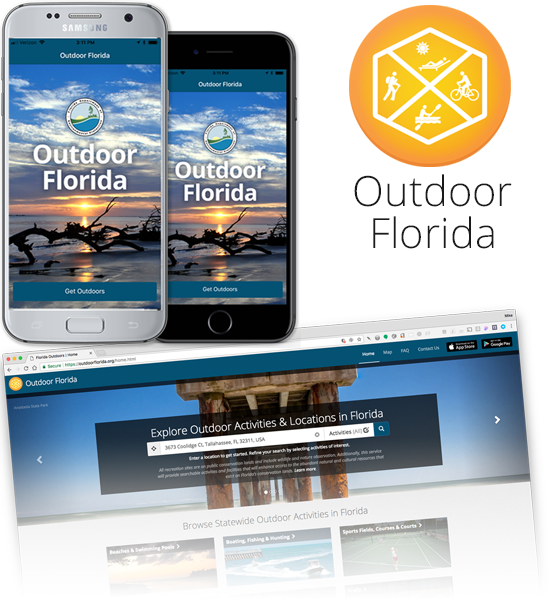 Challenge: To showcase the many locations throughout the State of Florida for outdoor recreational activities through native mobile apps and a companion web application. Solution: Created in partnership with the Department of Environmental Protection, Kyra Solutions developed Outdoor Florida, a native mobile app for iOS and Android devices. This cloud-based app provides an appealing and easy-to-use interface for the public to discover and explore Florida’s vast recreational opportunities. The app provides the ability to search a wide variety recreational activity types available at any location in Florida, and it displays points of interest on a map with customizable views. Each location also has a detail page with additional information, driving directions, website links (if available), and can be saved to ensure easy access to your favorite spots in the future. Background: The State of Florida lacked one central location that housed data on all state agencies’ real estate inventory. 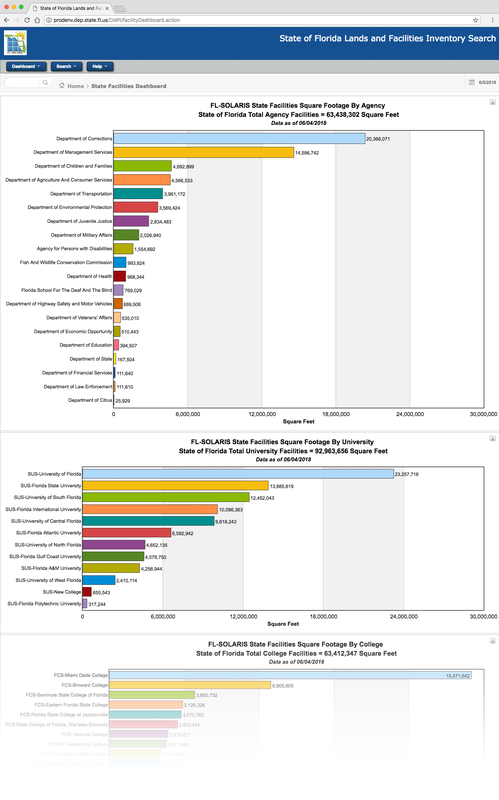 A lack of centralized and accessible data increased the State’s insurance premiums, caused inefficient accounting, underutilization of existing facilities and lands, and led to a large surplus in state-owned lands and buildings. Additionally, there was no mechanism for the public to easily access and view public real estate. Challenge: To identify, collect and aggregate the State of Florida’s real estate inventory into one accessible, reportable and transparent system. Solution: FL-SOLARIS, created in partnership with the Department of Environmental Protection and the Department of Management Services, allows the State of Florida to effectively manage owned, rented, and leased spaces utilized by Florida’s public sector through a single interconnected database. The system created contains four distinct areas. First, the facility module FITS (Facilities Inventory Tracking System) was developed to generate an automated inventory of all facilities, owned, leased, rented and occupied or maintained by a state agency. The second, a land module LITS (Land Inventory Tracking System) was developed to generate inventory of all state lands and real property leased, owned, rented, and occupied or maintained by any state agency. The third area, the public lands module includes all public owned lands. The fourth section of the system is the public interface portion which allows the public to access and view all of the state’s public land and facilities inventory. This access facilitates disposal of surplus state property by allowing agencies to consolidate within existing facilities, providing for better determination of overages in land and facilities. This can also be accomplished across agency lines where services can be provided out of the same office locations. The public access provides information on lands and facilities that agencies are planning to dispose of, allowing advanced planning and consideration time for private purchase. The creation of this centralized system with a public interface allows the State of Florida to more efficiently and transparently manage its assets, leading to wide-spread cost savings. Additionally, the database will help the State dispose of surplus spaces. By giving the State a single system to store and analyze the state’s real estate inventory, the agencies are able to more efficiently and effectively manage the use of state assets. Background: Airport parking’s paper ticket process creates additional hassles for customers burdened by the stress of airport travel. Customers often lose paper tickets during their travel. Additionally, during high traffic times, the ticket process is a slow means for processing the parking payments of airport customers. Airport operations needed a mechanism to speed up airport parking ticket processing for its customers. Challenge: To provide SunPass customers with a cashless, ticketless, and hassle free means to pay for airport parking. Solution: Kyra’s team, in partnership with the Turnpike, created and implemented an interface between the SunPass system and the Orlando International Airport. Additionally, we created and implemented real-time interfaces between the SunPass system and the Tampa, Ft. Lauderdale-Hollywood, Miami and Palm Beach International Airports where customer SunPass accounts are debited at airport parking gantries through the use of a transponder. If the customer does not have enough funds on their SunPass account, the system will charge the customer’s credit card on file on a real-time basis. The system then sends an electronic receipt to the customer. In addition to building the interface, Kyra’s team was responsible for operational testing and quality assurance, ensuring the correct amount is charged to each customer. The system also generates an end-of-day settlement report and pays the airport the amount owed daily. On average, this system processes five times more cars than the ticket system. Kyra Key Staff: Through the information technology staff augmentation contract, Kyra provided the following: Project Manager, Technical Architect, Technical Personnel, Financial and Software Technology Quality Assurance, and PCI Compliance staff for this project. Background: Prior to the conversion to Host-Based Account Balances, each SunPass transponder represented an individual account. Many customers have more than one transponder that are all paid by the same credit card. The conversion moved account balances from the transponder level to the SunPass account level, allowing for multiple transponders to be connected to one account. All of the transponders on one account are read as a combined balance instead as individual accounts with individual balances. Challenge: To increase SunPass customer convenience by creating a single SunPass account for each customer and to reduce the operating cost for SunPass. Solution: Kyra assisted the implementation of the Turnpike business rules in the SunPass system to house customer accounts at the SunPass account level. The team consolidated account balances if multiple transponders existed under one account. Additionally, the Kyra staff was responsible for the application development and operational testing of the system. By reducing the number of times a credit card is charged for a single account through combined balances, the conversion lowered SunPass operational costs while increasing customer convenience. Kyra Key Staff: Through the information technology staff augmentation contract, Kyra provided the following: Technical Architect, Technical Personnel, Financial and Software Technology Quality Assurance, and PCI Compliance staff for this project. Discover the value of Kyra’s success.